The footage shows a man, dressed in a white button-down shirt and gray slacks, berating an employee at the fast-casual eatery Fresh Kitchen in midtown Manhattan because the staff were speaking Spanish. 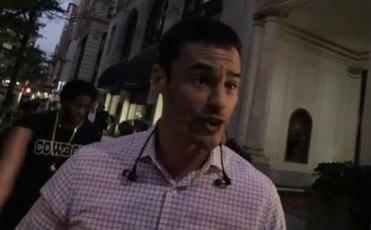 Maybe you read about Aaron Schlossberg, the New York lawyer whose racist rant in a Manhattan restaurant went viral this week. Diaz said in an interview with The Post that he believed Schlossberg should be suspended or disbarred. Complaints are confidential unless a finding is made to sanction or reprimand the individual, Lucian Chalfen, Director of Public Information at the Unified Court System, said in an email statement. Schlossberg has been the target of much anger since the rant was publicized. The Yelp listing for his law office was so flooded with thousands of one-star reviews - it had more than 2,900 as of Thursday afternoon - that the company announced it was conducting a ‘‘cleanup’’ of reviews motivated by news and not experiences with the business itself. The listing of the law office on Google was also modified to make it appear that it was a ‘‘Spanish restaurant,’’ according to screenshots shared online before the listing was fixed. The video kicked off a mad dash in New York as reporters from the city’s tabloid newspapers, the Daily News and New York Post, rushed to confront him about his statements. With cameras rolling, a couple of reporters pursued him down the street in the rain even as he began to run away at one point, asking him pointed questions as he shielded himself from them and their cameras under an umbrella. Another local reporter approached him at a courthouse in Queens. Critics say the man appears to have surfaced in a video of another heated political moment, a protest last year against Muslim activist Linda Sarsour where ralliers held signs and icons associated with the alt-right, the far-right movement associated with racism, xenophobia and anti-Semitism. In the video he is heard cursing that the person taking the video and chanting, ‘‘Milo,’’ for right-wing media personality Milo Yiannopoulos. The Washington Post’s Amy B Wang contributed reporting.